I’ve bought your book Food Sake Tokyo and find it to be lovely. 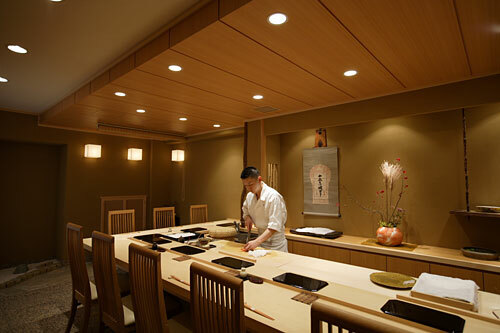 Could you please advise what is the average price per head for dinner at Ginza Harutaka? I would budget 20,000 JPY for an omakase course. Add more if you are going to have sake. Enjoy. Let me know if you go. I don’t know if he will remember me, but you can tell him Yukari Pratt sent you (my name before I was married). Many of my chef friends all suggest this as the best sushi in Tokyo. I thought it was the best I have ever had. Better than shops that get three Michelin stars in my opinion. Yes I will probably go, given how strongly you recommend Harutaka-san’s sushi! I had been to Sushi Kanesaka last year, but found it so-so. Perhaps because I did not order Omakase and when chef asked me “Sushi?” I simply replied yes! I’ll remember to order Omakase for sure next time. I currently live in New York and will be visiting Tokyo in late January. You’ll love Harutaka. Ask for “shun no sushi” which is seasonal. It is the same as “omakase” as the chef will pick out seasonal items. Also, it’s good to let him know your preferences, if you like whitefish “shiromi ga suki” or fishy fish “ao zakana ga suki” or any other preferences like “uni ga suki” for uni or “maguro ga suki” for tuna. In NYC, have you been to En Japanese Brasserie in the West Village? It is one of my favorites for a variety of Japanese food, including their freshly made tofu. Arigato Jay for visiting the site. I would budget 20,000 to 30,000 JPY for an omakase. Before you go, have your hotel call and give your budget. Also, if there are any particular sushi you like or anything you don’t like or can’t eat, have the concierge convey that before your arrival. Enjoy! Good question. I just took a look at the map online in English and it’s hard to tell. Can you contact your hotel and have them confirm? Maybe when they make the reservation for you at Harutaka. I think you want the Ginza exit, but best to confirm. Here’s the map I found.